Consumers are more optimistic about their personal finances and the wider economy, with many anticipating pay rises in the year ahead. This may help them fund some of the big ticket purchases they are also planning. Bank of Ireland's Economic Pulse for January shows an overall rise in sentiment during the month, with most of the activity coming from the consumer side of the survey. That is up for the second month in a row, according to Bank of Ireland, but is down year-on-year. Loretta O'Sullivan, chief economist with Bank of Ireland, said that this follows a softening in the second half of last year where concerns about Brexit/Trump were to the fore and consumers were wondering what this meant for the Irish economy. "But as we've headed into this year we've had a little bit more optimism about their own finances and the wider economy," Ms O'Sullivan stated. "Part of that is to do with some good news at the turn of the year - so we saw the unemployment rate falling to 7.2%, which is an eight year low, while the IDA announced that there was some positive FDI investments last year. That provided some reassurance for households coming into January," the economist said. Consumers were also more optimistic about what was to come in 2017 as a whole, with 40% anticipating some kind of pay rise during the year. This has helped to boost their spending intentions, with many expecting to splash out on big ticket items in the near future. "44% of people indicated that it's a good time to buy big ticket items like electrical items or furniture and one in four are likely to purchase a car in the next year," said Ms O'Sullivan. 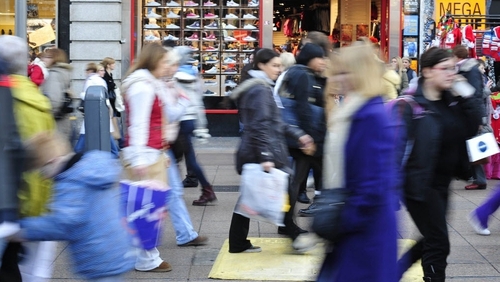 Consumers' increased optimism is not echoed in the business survey, however. Sentiment there remained relatively flat in the month,- though it does come after somewhat of a bounce in late 2016. However there is a clear note of caution amongst businesses, particularly in terms of their medium-term expansion plans. "Two in three expect to grow their business [in the next one to three years], which is a positive number, but it's a little bit softer than where we were this time last year when it was three in four," she said. Overall, though, the firms surveyed said they would increase their hiring again in 2017 - which is good news for the jobs market. There were also some sectors that appeared to be performing particularly well - not least retail, which is enjoying the benefits of that post-Christmas spending spike. MORNING BRIEFS - A number of multinationals have voiced their concern at the travel restrictions imposed by US President Donald Trump over the weekend. The CEOs of Apple, Facebook and Netflix were amongst those to publicly oppose the decision to suspend the US immigration programme and block travellers from seven majority Muslim countries. A number of other firms have also offered help to those affected by the decision. AirBnB CEO Brian Chesky offered free accommodation to anyone in need as a result of the ban, while Starbucks' CEO Howard Schultz pledged to hire 10,000 refugees globally over the next five years. And ride sharing service Lyft said it would donate $1m to the American Civil Liberties Union over the next four years. *** UCD Michael Smurfit Graduate Business School has been ranked 70th in the Financial Times' Full Time Global MBA Rankings, an increase of nine places on the previous table. The ranking was again topped by France's Insead, with Harvard Business School, London Business School and the Yale School of Management all featuring in the top 15. UCD's College of Business has committed €65m in spending over the next five years to the Smurfit Business School and aims to break into the top 50 of the FT's ranking by 2020.